Triquest was one of the fastest growing precision injection molding companies in North America when Triquest's shareholders determined the plastic injection molding business was no longer core to its business strategy. One of the reasons for Triquest selecting M&A Capital was its professionals knowledge of the plastic injection molding business, including the sale of IMC plastics. 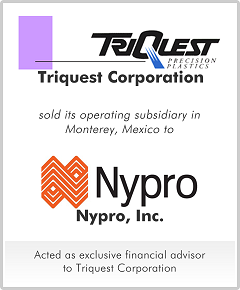 The sale to Nypro was structured as a sale of a 49% minority interest in Triquest's Monterey subsidiary. Nypro assumed managerial control of the joint venture and the company maintained its status as a qualified minority entity for Federal government "diversity sourcing" requirements. 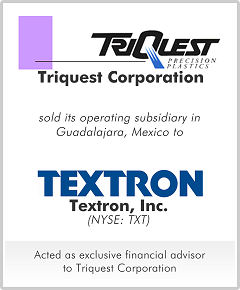 When considering its viable options, Textron was the highest strategic bidder, possibly due to its ability to consolidate certain operations due to its competitive internal operations. By completing the sale, Sealaska was able to invest its time and resources in other more accretive opportunities.